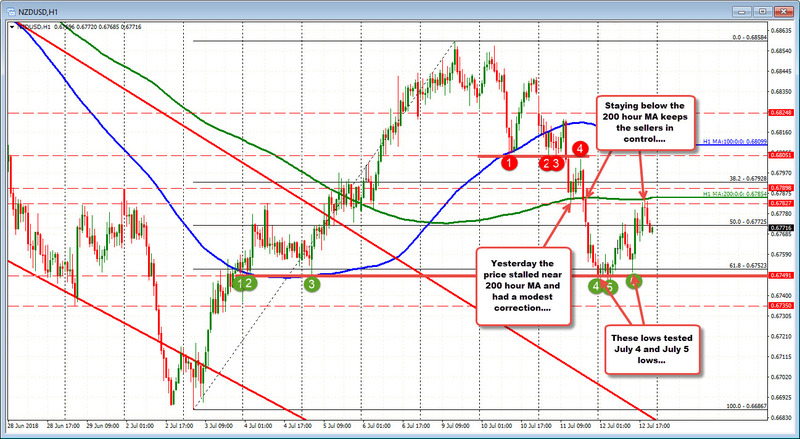 NZDUSD stays under the 200 hour MA. Bearish. When you look at the price action in the NZDUSD, the price stalled the fall near a support target area and at the high, the price stalled at a key resistance target. On the downside, the early day fall stalled near swing lows from July 4th and July 5th (see green circles 1, 2 and 3). The price tested the area in the Asian and later in the London session (see green circles 4, 5 and 6). The rally off the last low, took the price to a NY session high against the 200 hour MA (green line in the chart above). Recall that yesterday, the price initially stalled at the 200 hour MA, corrected toward a floor area at 0.6805 and then broke below the 200 hour MA. So, support held, resistance held. Staying below the 200 hour MA probably gives more of the edge to the sellers technically. Stay below and a retest of the swing lows at 0.6750 area will test the will of those bears. Move above the 200 hour MA and the buyers start to take back more control. IN the new day, the NZ Business Manufacturing index will be released in the new day.